Attack on Titan (literally translated as "Advancing Giants") is a Japanese manga series, and now an anime, originally written and illustrated by Hajime Isayama. 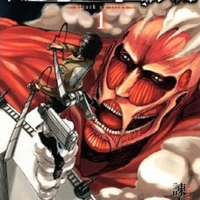 The story centers around the lives of Eren Yeager, his adoptive sister Mikasa Ackerman, and their friend Armin Arlert, who live in a world where the remnants of the human population live inside cities surrounded by enormous walls due to the sudden appearance of the Titans, gigantic humanoid creatures who devour humans seemingly without reason. Their lives are changed forever after the appearance of a colossal Titan brings about the destruction of their home town and the death of Eren's mother, spurring them to enter the army to battle the Titans themselves. 18401 users rated Attack on Titan [TV]. Return to Attack on Titan.